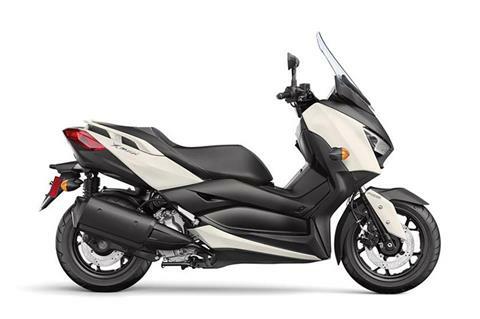 The XMAX is the ultimate Sport Scooter with a liquid-cooled, four-valve, fuel-injected engine that is fuel efficient while producing awesome acceleration. MAX SERIES DNA: The XMAX pushes the design envelope with advanced sport styling and aggressive, angular cues that set this Yamaha way ahead of the competition, for a high-class appearance that elevates the XMAX beyond expectations. MOTORCYCLE-TYPE FRONT FORK: Unlike most scooters, the XMAX features a large motorcycle-type front fork that bolts to the steering stem at both the top and bottom triple clamps. This provides an ideal balance of strength and chassis rigidity, allowing for better damping feel and shock absorption compared to typical scooter-style forks. LIGHTWEIGHT STEEL FRAME: Designed for light and neutral handling character, the XMAX’s steel frame results in a wet weight of only 397 pounds fully fueled, for exceptional maneuverability. LARGE WHEELS AND TIRES: The XMAX features large 15-inch front and 14-inch rear wheels for enhanced handling and sporty style. 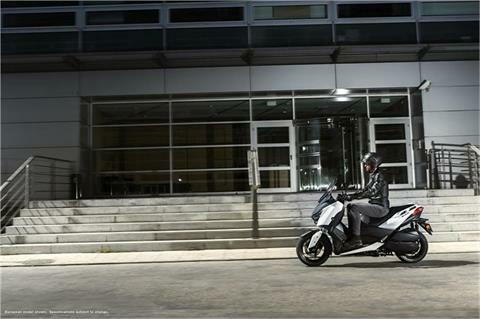 The XMAX also mounts the latest Dunlop® Scoot Smart tires for good traction in both wet and dry conditions. ANTI-LOCK BRAKING SYSTEM: With large 267 mm and 245 mm front and rear disc brakes, the XMAX gives the rider controllable braking power backed up by the security of Yamaha’s anti-lock braking system, for confidence in all sorts of road conditions. 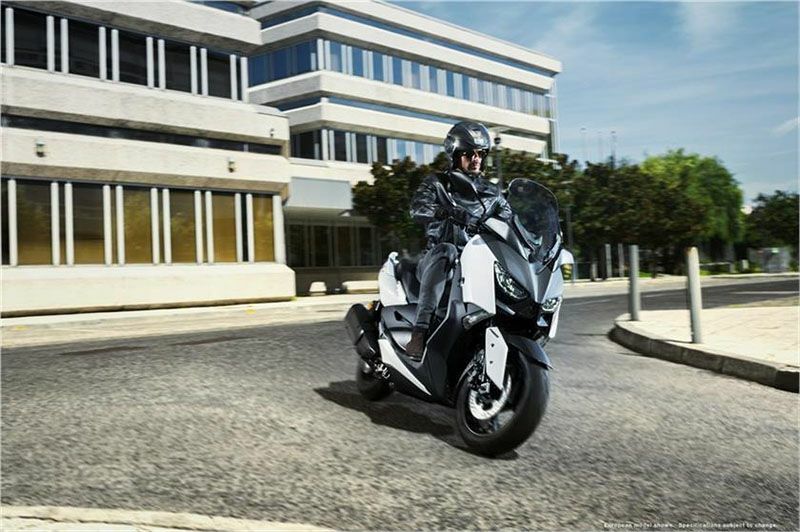 292 CC ENGINE: The XMAX is powered by an advanced 292 cc liquid-cooled, four-valve single that develops smooth, tractable power. The cylinder is crafted from Yamaha’s DiASil aluminum for excellent heat dissipation, with a lightweight forged piston and forged crankshaft. A counterbalancer ensures minimal vibration, while the offset cylinder layout and semi-dry-sump lubrication system help reduce friction and drag inside the engine. FULL AUTOMATIC CONVENIENCE: Thanks to Yamaha’s Continuously Variable Transmission, the XMAX offers the convenience of truly ‘twist and go’ riding, which no gears and no clutch. This gives the XMAX an easy-going riding character that is ideal for busting city traffic on weekdays and enjoying a relaxing ride on the weekend. The CVT system also features a large air-cooling path for the drive belt, reducing heat and engine noise significantly. 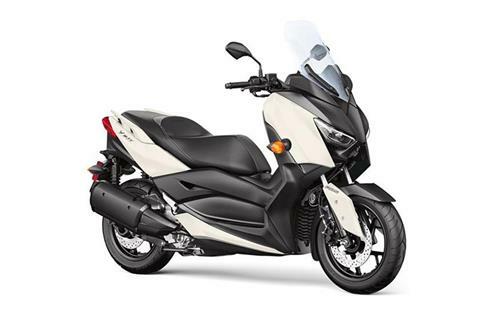 FUEL INJECTION AND TRACTION CONTROL: Modern fuel injection features a 12-hole injector for excellent response, and just like Yamaha’s cutting edge supersport and sport-touring machines, the XMAX features a traction control system. TCS continuously monitors wheel speeds, and if the system detects rear tire slip, the engine smoothly cuts power to help prevent uncontrolled wheelspin. IMPRESSIVE FUEL ECONOMY AND RANGE: Thanks to the efficient engine design features and advanced powertrain, the XMAX delivers 75 mpg. Combined with a large 3.4-gallon fuel tank, the XMAX boasts impressive cruising range. SMART KEY SYSTEM: Yamaha’s Smart Key system eliminates the need to use the key to access the machine. Starting the bike, accessing the storage compartments and fuel tank, and locking the handlebar can all be done using the proximity Smart Key. ALL-INCLUSIVE STORAGE: Further boosting convenience is a huge underseat storage area that locks securely to keep valuables safe, is large enough for two full-face helmets, and comes standard with LED lighting. The fairing also includes two additional storage bays, one of which locks electronically and includes a 12V DC outlet. LED LIGHTING: Boosting both style and visibility, the XMAX uses LED lighting, with sharp LED taillights and brilliant all-LED headlights. LEDs also use less power and last much longer than conventional bulbs, reducing maintenance needs. ADJUSTABLE HANDLEBAR AND WINDSCREEN: The XMAX includes an adjustable handlebar, with 20mm of rearward adjustment, which can be changed quickly with zero additional parts. The XMAX also features a two-position windscreen that can be shifted two inches higher for additional wind protection. Finally, the sculpted saddle makes it easier to reach the ground at stops and works with the floorboards for a flexible all-day riding position. MAX SERIES DNA: More than just a practical commuter, the stylish XMAX™ features aggressive, angular bodywork for a high-class appearance that elevates the XMAX beyond expectations. 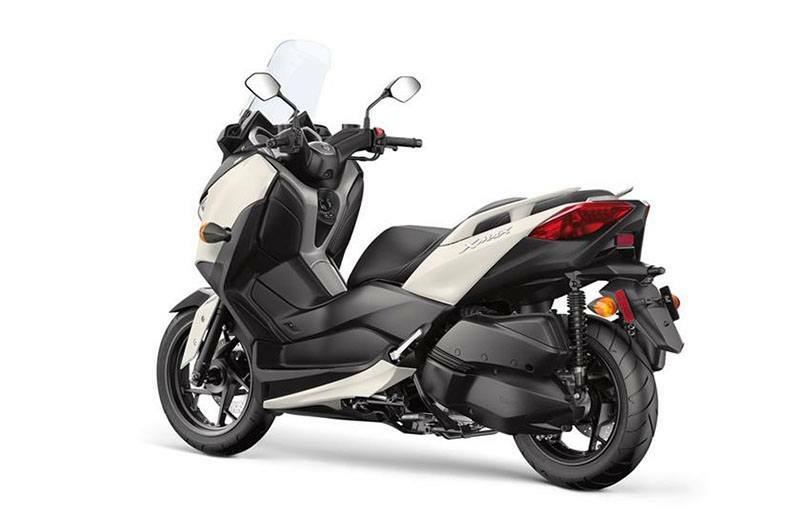 SPORTY, FUEL EFFICIENT ENGINE: Featuring technology developed for use in Yamaha’s high-performance sport bikes, the XMAX motor is smooth, efficient and ready for everything from the day-to-day commute to fun rides on the weekend. CONVENIENCE AND TECHNOLOGY: With a fully-automatic transmission, the XMAX is exceedingly simple to ride, and comes standard with an extensive list of rider aids, including traction control and ABS. Combined with a frame designed for light and neutral handling, the XMAX makes for a confidence inspiring ride on any road. 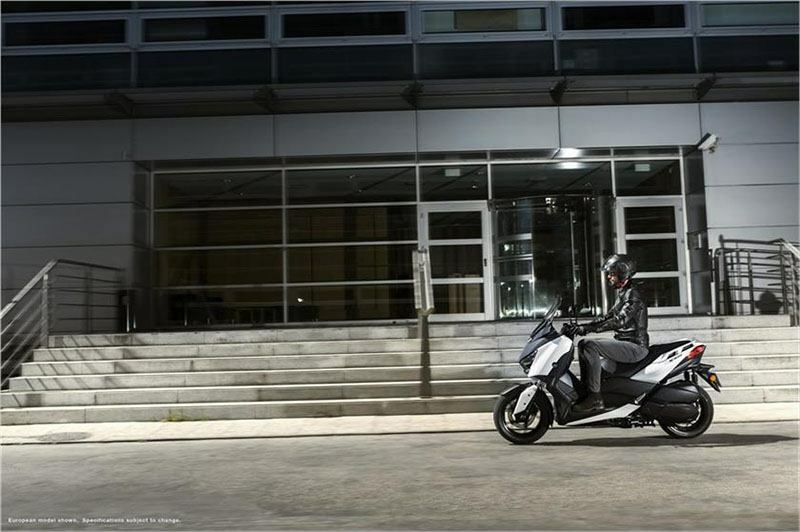 LUXURY + COMFORT + PRACTICALITY: High-tech features distance the XMAX from your typical bare-bones scooter, including LED lighting and advanced instrumentation. With plenty of lockable onboard storage, a 12V power port to recharge small devices and an adjustable handlebar and windscreen, the XMAX is a ready to go whenever you are, whether you need to get groceries down the street or head across the state.